"It all started the day that I died. If there had been an obituary, it would've described the unremarkable life of an unremarkable woman survived by no one. But there was no obituary because the day that I died was also the day I started to live. But that comes later." The setting was a big city, where Patience Phillips (Halle Berry) worked in an art department job ("the practical version of my passion") as a graphic designer of ads for beauty cream. Specifically, a revolutionary new Hedare Corporation beauty cream to be released in one week named Beau-line - a product of the cosmetics firm tauted to reverse the effects of aging. Patience was talented, but insecure and a people-pleaser, and when confronted by her egomaniacal CEO boss Mr. George Hedare (Lambert Wilson) about her designs, she became completely intimidated. The next morning, a growling cat sat outside her apartment window and she thought it was stuck. When she stepped out onto the window ledge, she found herself in a precarious position atop an unstable air conditioning unit. A passing cop named Detective Tom Lone (Benjamin Bratt) stopped his car, believing she was committing suicide, and rushed up the stairs to her apartment to help save her life - and then learned that she was only saving someone else's cat. They became acquainted and he invited her to coffee the next afternoon. One of the company's scientists in the development lab, Dr. Ivan Slavicky (Peter Wingfield), suspected from his long-term studies that the new product was defective and had serious side-effects - over time, the beauty cream would cause a person's skin to decay. As Patience was delivering her new ad design at the midnight deadline to her boss at Hedare headquarters, she overheard Slavicky's protests and concerns: "I can't live with turning people into monsters. You gotta let me pull the plug. We can't let this go on the shelves." Patience was spotted and fled as one of two security guards fired his gun at her. She ran into a waste treatment area and jumped into a water pipe. Her boss' evil masterminding wife Laurel Hedare (Sharon Stone) ordered: "We can't risk it. Get rid of her" - the pipe door was sealed and flooded, and Patience drowned. Afterwards, her body was surrounded by cats, and she was revived by the magical breath of the cat she had attempted to rescue earlier. She woke with a heightened sense of perception and quick reflexes, prowled through the city's streets and found that she could leap great distances like a cat. Patience broke into her own apartment, and missed her date appointment that afternoon with Detective Lone. She discovered the cat that had saved her belonged to Ophelia Powers on Elm Street. She visited Ophelia whose home was filled with cats. The Catlady told her that the cat's name was Midnight - an Egyptian Mau, "the rarest of breeds. Temple cats" with special powers. Patience realized that she couldn't remember the previous day's events, including her own murder, although she was surprised that she responded cat-like to catnip (and later enjoyed tuna fish straight from the can). Back at work, she was reprimanded for not delivering the design and for losing her memory - and was promptly fired for insubordination toward Hedare. She looked up good-hearted Detective Lone to become reacquainted. Meanwhile, Laurel Hedare was continuing to be spiteful that her unfaithful husband was sleeping with the new Beau-line model Drina (Kim Smith) that had replaced her as the face of Hedare. She crushed a drink glass with her bare hand, but was uncut (one of the toxic after-effects of the beauty product). As time went on, Patience realized she had been transformed into a cat - she was able to crack a whip and had super-human powers. She decided to wear a masked, black-leather feline costume (with a mask), and cropped her hair short. She came upon a jewel robbery in progress in the down-town area and apprehended the three thieves with her new cat-like abilities (showing her adeptness in the Brazilian martial art of capoeira). Patience searched on the Internet about cats in history to learn more about the Egyptian Mau. Back at Ophelia's house, she discovered that the Maus were sacred messengers of the Egyptian goddess Bast ("a goddess of the moon and of the sun") that represented duality ("docile, yet aggressive, nurturing yet ferocious"). She was told she had died and was reborn. "Catwomen are not contained by the rules of society. You follow your own desires. This is both a blessing and a curse. You will often be alone and misunderstood. But you will experience a freedom other women will never know. You are a catwoman. Every sight, every smell, every sound, incredibly heightened. Fierce independence, total confidence, inhuman reflexes." She was presented with a full cat mask head-piece. Patience was determined to find out who killed her, and why. In the next sequence, the Catwoman wore a skimpy leather outfit (showing lots of bare skin) and bright red lipstick as she prowled the streets and rooftops during the nighttime hours. She stalked the security guard who had murdered Patience and wielded a whip to question him about the murder. She learned that Patience had been killed because of a cover-up regarding Beau-line, and then at Hedare headquarters discovered the body of Dr. Slavicky (murdered by orders from Laurel). She fled when a night security guard saw her standing over the corpse - and the next day's news named her as the suspect killer. She feared that the cosmetic cream was making her best friend/colleague Sally (Alex Borstein) sick with headaches, as Slavicky had predicted. At the Hedare mansion, Catwoman confronted Laurel and told her: "If your husband ever comes home, tell him I know all about Beau-line. It's disease in a jar. I wouldn't caulk a sink with it." And she knew that Slavicky was killed as part of a cover-up - which Laurel blamed entirely on her husband. Catwoman found Laurel's husband and her ex-boss George attending a theatrical performance with model Drina. When confronted alone, he protested ("Get your paws off me this instant"), and proclaimed his innocence about the cream's toxic qualities, the cover-up, and Patience's murder. The police raided the playhouse (led by Detective Lone), and after Lone had a one-on-one fight against Catwoman (and she left a lip imprint on his cheek), she escaped in the dark after causing a power outage. During a date at a Japanese restaurant with Lone, Patience voraciously ate the sushi, and then asked about his pursuit of Catwoman ("hot, black leather, whip"). He revealed: "She kissed me." But then he confessed that she appealed to him more: "You're different. You're special." Afterwards, she wanted to confess her identity as Catwoman, but couldn't. They made love at her place (she left scratch marks on his bare back) and when he got up in the middle of the night to leave, he found one of Catwoman's claw-nails on the floor. He also took one of her drinking glasses with a lip imprint, to see if it matched the lip imprint on his own cheek. The results showed there was a 99.9% probability of a match. Laurel phoned Catwoman, and suggested working together with her to stop her husband's release of the toxic product. Catwoman was lured to the Hedare mansion where she found George brutally murdered on the floor, covered with cat-claw marks - she realized she had been set-up by Laurel, who tossed the murder weapon ("smoking gun") into her hand and then summoned the police. She had remarked: "No one is gonna stop Beau-line from hitting the shelves. Not Slavicky. Not George, and certainly not you." Although she escaped the mansion and changed out of her Catwoman costume, Patience realized she was being sought for Hedare's death. She was arrested by Lone (who knew about her double-identity), was questioned about the two deaths she was suspected of committing ("all of the evidence...points to you") - and jailed. Midnight came to her jail cell that night and demonstrated how to squeeze through the bars to escape to the street, where she stole a Jaguar. As Hedare's new chief executive, Laurel held a press conference to pay tribute to her dead husband, and to announce the launch of the new beauty product. Meanwhile, Catwoman sabotaged some of the trucks readied for the midnight delivery of Beau-line. Detective Lone consulted in private with Laurel in her office, and told her that he had "evidence" that showed she was a suspect in the two murders rather than Catwoman. She pulled a gun on him and shot him in the right arm - and as she threatened to kill him ("Give my regards to my husband"), Catwoman appeared and whipped the gun out of her hand. The two escaped, and Catwoman fought off Laurel's two henchmen. She then confronted Laurel, and accused her of murder: "It was me you flushed down the pipes...I'm Patience Phillips." Laurel felt she was invincible from Beau-line's effects: "You stop using it and your face disintegrates. And if you keep using it, skin like living marble. And you can't feel a thing." However, Laurel's invulnerable face was slashed by Catwoman's claws, and she hung precariously in a broken glass window frame many stories high. When she saw the reflection of her deteriorating face, she refused to take Catwoman's hand and fell to her death. Detective Lone witnessed the accident, and assured Catwoman that Laurel's henchmen would talk, and if Patience was back in her cell by morning, it would be "awfully tough to prove that she was Catwoman." The film concluded with the Hedare Empire being toppled by Catwoman. Patience sent Ophelia Powers a piece of her artwork and a thank you note. She also sent a conciliatory goodbye letter to Detective Lone, heard in voice-over (as she walked along a building ledge next to Midnight, and then walked silhouetted in front of a full moon while cracking her whip), about how he was "in a world that has no place for someone like me. You see, sometimes I'm good. Oh, I'm very good. But sometimes I'm bad. But only as bad as I wanna be. Freedom is power. To live a life untamed and unafraid is the gift that I've been given and so my journey begins." The credits mentioned: "Based on characters created by Bob Kane and published by DC Comics." 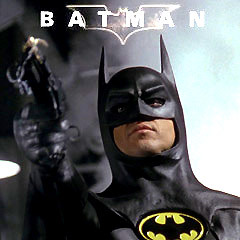 Critically-assailed with contempt, and bearing little relation to the previous DC Comic character portrayed by Michelle Pfeiffer in Batman Returns (1992). With a production budget of $100 million, the film's box-office was $40 million (domestic) and only $82 million (worldwide). From its seven Razzie nominations, it won four: Worst Actress (Berry), Worst Director, Worst Picture, and Worst Screenplay.